Each year over two million people in the UK experience domestic abuse and SafeLives research finds that at the time they start school at least one child in every classroom will have been living with domestic abuse since they were born. We know that 85% of victims seek help five times of average before they get effective support, however less than 1% of perpetrators receive any form of specialist support to change or challenge their behaviour. Every survivor of domestic abuse, and their family, deserves the right response at the right time, to make them safe, sooner. That's why we're developing new interventions and ways of working to improve outcomes for whole families experiencing domestic abuse. Over the next three years, we aim to create two 'Beacon' sites of best practice: Norfolk and West Sussex. Our interventions in these sites will create systematic change by introducing a whole picture approach, working alongside existing services to improve the response, and challenging perpetrator behaviour. 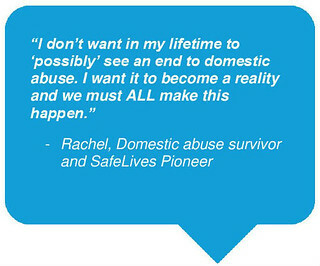 The Beacon sites will offer a package of tailored support for victims, survivors and families. Support for survivors to recover from the harm, heal and build resilience. This sits on the foundation of a strong risk led model that supports every victim, survivor and child experiencing domestic abuse. In Norwich we're delighted to be working with partners from the Norfolk County Community Safety Partnership and Spurgeons Children’s Charity. Find out more. In West Sussex, we're delighted to be working in partnership with West Sussex County Council, The YOU Trust, Aurora New Dawn and The Hampton Trust. Find out more. For more information about the work we've been been doing to improve the response to domestic abuse, and our plans for the future, please see our annual report. Without substantial funding from Norfolk County Community Safety Partnership, West Sussex County Council, The National Lottery Community Fund and further funding from The Esmée Fairbairn Foundation, The Peter Cundill Foundation and The Aurum Charitable Trust, this project would not be possible.